The world’s first fully solar-powered airport. India’s has opened the world’s first airport powered completely by solar energy. 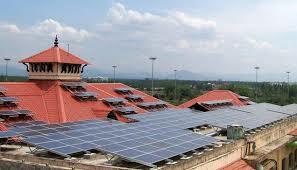 Cochin International Airport has been exclusively using solar from two smaller power plants installed in 2013. A solar plant consisting of 46,150 solar panels (pictured left) was installed across 45 acres near its cargo area. It supplies the airport with all of it’s electricity making it ‘POWER NEUTRAL’ according to the CIAL. India’s leading sustainable airport had been using solar energy from 2013, but the latest additions bring its solar capacity to 12mw of power per day, enough to run the complete facility. If you are thinking of travelling to india and would like to discuss a bespoke holiday itinerary, give the team at Howards Way a call and we ca help organise the tailor made holiday of a lifetime.